These dreamy Tiramisu Smoothies really do taste like the dessert and they are much easier to make! 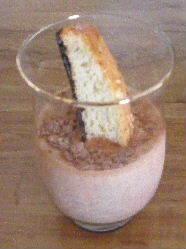 Dip Biscotti or shortbread cookies in the smoothie for a one of a kind taste. I make these with sugar free ice cream and you can't tell the difference. Place Mascarpone, vanilla ice cream and 1 tablespoon powdered sugar in a blender and blend until smooth. Pour into a glass pitcher and set aside. Next place chocolate ice cream and coffee in the blender and blend until smooth. Pour mixture into 4 glasses evenly. If you want the chocolate and vanilla to stay divided, place the 4 glasses in the freezer for about 15 minutes, also putting the vanilla mixture in the refrigerator. No one in my family can wait that long so they get mixed. Next pour vanilla mixture on top of the chocolate. In a small bowl, mix together the last two teaspoons of powdered sugar and the cocoa. 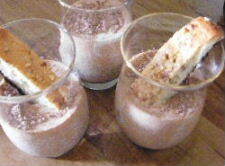 Sift this mixture over the top and serve with your biscotti or shortbread cookies. Click here for more great smoothie recipes like Tiramisu Smoothies!